Bawang putih or garlic has Latin Name: Allium sativum Linn. Habitat: Grown in the mountainous area gets enough sunlight. Description of the plant: Plants that cloves, each clove wrapped with thin skin. Ribbon-shaped leaves and fibrous roots. The flowers are white. Garlic 2 g; Rhizome temugiring ( Curcuma heyneana )4 g; 2 tablespoons of boiled water, contused, Drink 1 a day 1 tablespoon; repeated for 4 days. 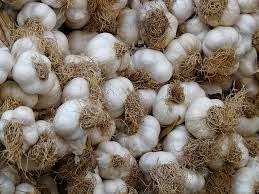 Parent garlic bulbs 2 pieces; 75 g of fresh celery leaves; Taste of boiled water, contused, Taken 2 times a day; 1/4 cup.